Shayla began nurturing her natural healing abilities nearly 30 years ago when she began studying under a Master of 'laying on of hands'. After many years of doing intuitive healing, she yearned for more formal training. With this goal, Shayla set forth to study more than 1,000 hours at the Healing Arts Institute and emerge a well trained therapeutic therapist. Upon moving to Maui in 2004, her heart and her work merged in the study of the ancient Hawaiian bodywork, lua lomi. A practice rooted in understanding Spirit both in the client and the Great One above. So grateful in 2005 to have met a truly gifted healer, a Hawaiian lua lomi Master whom immediately became her 'true Teacher'. She has studied extensively with him for nearly 10 years when she 'graduated' and became his trusted TA (teaching assistant). They have begun to travel and share the magic of this uniquely powerful practice. Shayla's original inspiration to enter the healing profession began as a self healing journey with a strong yearning to help others. She decided that bodywork - being a universal language- was an incredible avenue to achieve this goal. Forever excited by the unique joy of helping clients become a little more 'comfortable in their own skin', she is grateful to have been able to take her natural affinity and abilities for healing to the 'next level' during her formal education process. She believes that the better understanding she has of the human anatomy, and the more familiar she becomes with the art of movement and its effects and stresses it poses on the body- the better she can serve her clients. 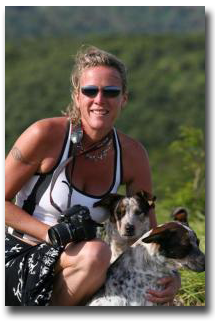 She draws upon well over 2,000 hours of formal class training, 15 years of hands-on, anatomy-driven, experience as a licensed Massage Therapist and over ten years study under a Master Hawaiian Lua Lomi practitcioner. "I believe it is helpful to have a guiding philosophy in ones practice"
Shayla holds a deep seated belief in the body's own wisdom and its extraordinary ability to heal. "I believe in the miracle of rejuvenation and the wonder of recovery. Much like a small cut can close, scab and heal - larger soft tissue issues can also recover and return to an original unblemished state." "I offer my clients amazingly effective techniques to achieve a uniquely healing and relaxing experience."